This week I'm obsessed with... Yes to Tomatoes and Coconut 2-in-1 Scrub & Cleanser Sticks! Yes to Tomatoes Clear Skin Detoxifying Charcoal 2-In-1 Scrub & Cleanser Stick - 70g - $13.49 - formulated with charcoal powder to remove impurities and excess oil, as well as tomato extract to help leave skin naturally clear. Convenient stick formula melts into a creamy lather on wet skin, for a quick and easy detox, and deep clean and is perfect for use on-the-go! 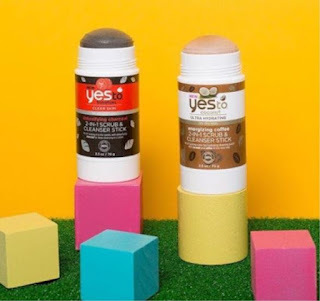 Yes to Coconut Ultra Hydrating Energizing Coffee 2-In-1 Scrub & Cleanser Stick - 70g - $13.49 - formulated with coffee to energize and enhance skintone and coconut for the much needed moisture that dry skin craves! Just twist up stick from the base and apply generously onto wet skin. You’ll feel the exfoliation go into action and the formula melting on contact. Massage with hands to create a milky lather, activating the cleansing experience. Rinse face clean with water and you're good to go! Available now at drugstores and mass retailers across Canada.